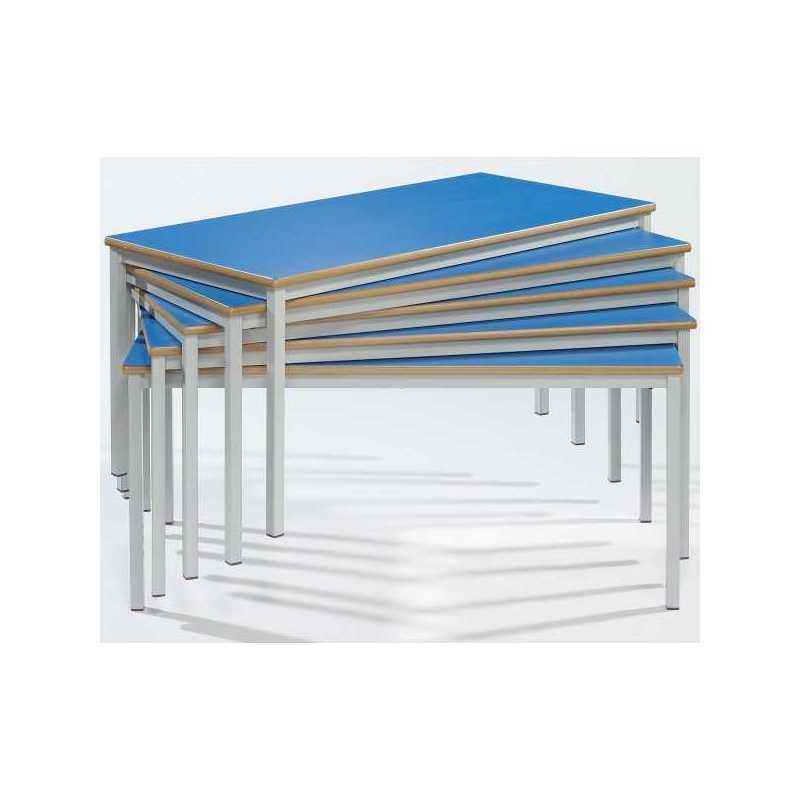 Our affordable range of durable classroom tables are created with a strong fully welded frame which enables these to be stacking classroom tables, spiral stacking directly on top of each other. Available in 9 top Colours, easy wipe clean, & 4 frame Colours. Edge finish either MDF Bullnose or High impact PVC edge. Classroom Tables with a fully welded frame, spiral stacking classroom tables. 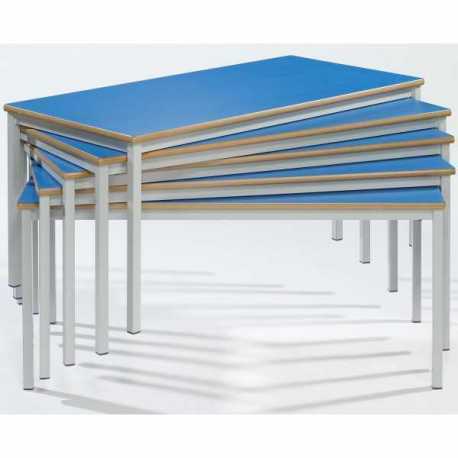 The most comprehensive and most competitively priced classroom table range available. Our Rectangular classroom tables are an essential part of every school environment. Manufactured in the UK to very high standards by the most reliable manufacturer of Quality classroom tables . Fantastic value hardwearing Rectangular classroom tables. Laminated easy wipe clean MDF tops, 18mm. Available in 9 top Colours. Available in 4 frame Colours. Hardwearing, easy wipe clean Laminate tops. Choice of durable PVC edging of hardwearing MDF rounded bullnose edge. 25mm square leg system that is longer on one side enabling you to stack with ease. Frames constructed from strong 1.5mm gauge steel and epoxy coated for maximum life. Designed to suit any educational environment. Frames have adjustable leveling feet for grouping together and uneven floors. Shape and size options for all age groups. Prices to meet your budget. FOR DELIVERIES TO SCTOLAND POA PLEASE CALL US. EDUCATION ESTABLISHMENTS ARE WELCOME TO SEND OFFICIAL PURCHASE ORDERS AND LET US TAKE CARE OF THE REST !! Having been let down several times by other suppliers we decided to purchase these tables from Mike O'Dwyer Limited. What a great company to deal with from the initial phone call to delivery. They accepted our Purchase Order, offered extra discount for the Quantity we were ordering and advised of a delivery date which was bang on. Tables are good Quality, all our specifications were met. I will definitely make this company our go to furniture supplier from now on. We ordered a large number of these tables for our new Academy in various sizes and Colours, we have found the tables to be excellent quality, delivery was quick and as advised, customer service was flexible and helpful. Ordered these tables from Mike O'Dwyer Limited and I have to say the service, price and quality of product have been excellent, Good choice of sizes and Colours, delivery was as advised, friendly customer service, I will definitely order again in the future. We have relied on Mike Odwyer for our classroom furniture since 2009 and have never been disappointed. Quality has always been great, delivery was on time or earlier and prices have been and still are affordable. Thank you!